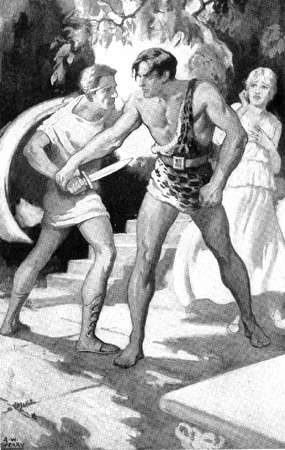 EDGAR RICE BURROUGHS enjoyed the distinction of having his books illustrated by several critically accepted artists. Among these have been N. C. Wyeth, Frank E. Schoonover, J. Allen St. John (especially in the early part of his career), C. E. Monroe, Jr., Robert Abbett, Frank Frazetta and Michael Whelan. However, one of Burroughs' illustrators managed to produce work, contemporaneously and for a time, which was more critically acclaimed than his own. And he VMS both illustrator and writer. During his lifetime, Burroughs received no literary awards, even though his output was prodigious and his stories beloved by millions at the peak of his long career. Yet, today, if you were to mention the name of Armstrong W. Sperry in art or literary circles, even among Burroughs fans and collectors, you would find it virtually unknown, although he was the winner of the prestigious John Newbery Medal for the most distinguished contribution to American books for children in 1941, the New York Herald Tribune Children's Spring Book Festival award for 1944, and the Boy's Clubs of America Junior Book Award of 1949. In the realm of Burroughs literature, Sperry had the distinction of designing and illustrating the first Burroughs book to be published (September 28, 1929) by Metropolitan Books. 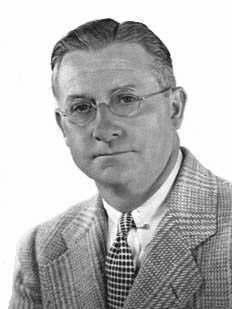 Armstrong Sperry was born on November 7, 1897 in New Haven, Connecticut to Sereno Clark Sperry and his wife Nettie. His father was a business executive and his forebears were among the state's earliest settlers. On one side of the family the men followed the call of the sea, while those on the other tilled the soil. Throughout most of his life, Sperry was conscious of these two dichotomous impulses within himself. He maintained a working farm. in the green hills., of Vermont, but on occasion could not resist the call of the sea, the sound of breaking surf, or the sight of tall ships. As a young boy, Sperry often sat wide-eyed at the feet of his great-grandfather, Captain Sereno Armstrong while he related stories of hair-raising adventures among pirates in the China Sea or among the cannibals who lived on lagoon islands rich with pearls. In particular, he was delighted with stories about a wonderful South Sea island named Bora-Bora, and he promised himself that, one day, he would sail there. But reality soon intruded on his daydreams. His heart may have been in the South Seas but his parents insisted that he get a proper education. Sperry attended the Stamford Preparatory School where he spent most of his time drawing pictures and scribbling stories. His frustrated teachers merely shook their heads in gloomy doubt, certain that no good would come to any boy who preferred drawing cannibals to solving the knotty problems of algebra. After graduating from high school in 1914, Sperry worked for a while doing odd jobs. It wasn't long before the nation was embroiled in the First World War and he joined the United States Navy where the spent the year of 1917. Sperry received his first formal art training when he entered the Yale School of Fine Art in 1918. In 1919 he headed for New York City and was soon enrolled in the Art Students League where he studied for three years under George Bellows and Luis Mora. He then traveled to Paris, France in 1922 where he studied at Colorassi's Academy. On his return to America, Sperry's practical career in illustration began when he answered an ad for "Help Wanted ... Artist." He was hired and spent a year working for $25 a week drawing pictures of vacuum cleaners, canned soup and beautiful blonde women wearing Venida hair nets. Not remarkably, he found himself thinking of Captain Armstrong, the South Seas, and especially Bora-Bora. Sperry also waxed nostalgic about a book that had enchanted him in 1919, Frederick O'Brien's WHITE SHADOWS OF THE SOUTH SEAS which contained 63 alluring black and white photographs. This memory was what gave him the additional impetus for deciding to quit his job and sail off to the South Seas. This was before Hollywood had discovered Tahiti or Dorothy Lamour made the sarong a national commodity! Taking pen in hand, Sperry wrote a letter to O'Brien requesting information concerning ways and means of sailing to the South Seas. "And that," remarked Sperry, "was how I came to be standing on the deck of a copra schooner on a bright sunny June day in 1925, sailing from Tahiti to Bora-Bora." He had signed on as assistant ethnologist with the Kaimiloa expedition to the South Pacific. His first sight of Bora-Bora was everything that Sperry had dreamed it would be: I saw a single great peak towering 2,000 feet, rising straight up from the plane of the sea. This peak was buttressed like the walls of an ancient fortress, and it was made of basalt ... volcanic rock ... which glistened in the sun like amethyst. There were waterfalls spilling from the clouds and, up in the mountains, the wild goats were leaping from peak to peak. There was something so fresh about that island that it seemed as if it had, that very morning, risen up from the floor of the sea with the spray still shining on it." Sperry said: "The thing which remains with me most vividly from those months on Bora-Bora, stronger than the manifold charms of the island, is the remembrance of the great courage with which that little band of Polynesians faced the destruction of their world and faced it down, and stooped, only to rebuild." Upon his return to New York Sperry settled back into his work as a freelance illustrator working for several accounts I in the field of commercial advertising or illustration. His brush and ink or pen work somewhat resembles old fashioned wood block prints. His paintings are more in the mold of N. C. Wyeth ... boldly masculine and colorful. A book found on some Burroughs collector's shelves, CARNAK THE LIFEBRINGER "The Story of a Dawn Man Told by Himself" interpreted by Oliver Marble Gale, published by the William H. Wise Company, New York, 1928, contains some of Sperry's most exciting illustrations: a color frontispiece and three full color plates. These run the gamut from placid forest scenes to bone crunching battles. The color frontispiece also appears on the dust wrapper. Sadly, few books are known which contain his illustrations prior to the advent of his own writing career. 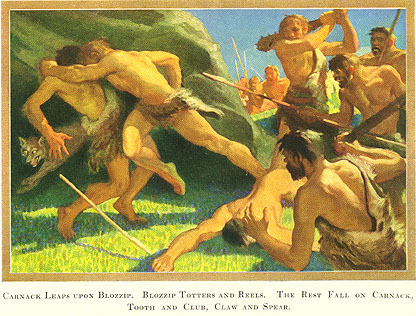 The next year, Sperry illustrated TARZAN AND THE LOST EMPIRE for Metropolitan Books. There is a possibility that Sperry was working for the United Features Syndicate along with Rex Maxon, Paul Berdanier, and Hugh Hutton, since they were working in Metropolitan's art department at the same time (Maxon excepted). It can be assumed that the need to keep production costs down explains why Sperry was commissioned only to do the dust wrapper and a frontispiece for TARZAN AND THE LOST EMPIRE. The dust wrapper features Tarzan, clasping a sword and standing in the center of the arena at Castra Sanguinarius. It is done in Sperry's woodcut style with color being added at the printer's. The back of the dust wrapper features a small portrait of ERB and various African animals, all done in the woodcut manner. This portrait of Burroughs and the animals was used on the back of the Grosset & Dunlap reprint dust wrappers after 1940, and on the back of most of the Edgar Rice Burroughs, Inc. 1948 reprints. The frontispiece (pictured below), though black and white, is powerful and ably displays Sperry's command of design and anatomy. 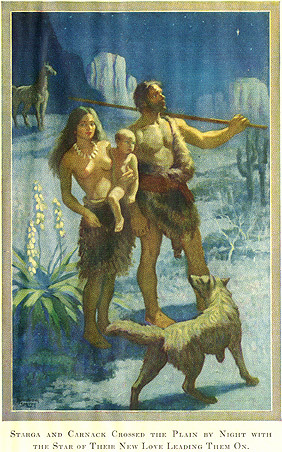 This was the first book to depict Tarzan wearing an over-the-shoulder leopard skin, no doubt inspired by Frank Hoban's illustrations for BLUE BOOK magazine. It was also the first book, after TARZAN OF THE APES, to be illustrated by an artist other than J. Allen St. John. Three years later, Sperry began his career as a writer and illustrator of children's books. He had long desired to write of the South Seas, using his own experiences to lend realism to these stories. Children seemed the logical audience for the wealth of material he had acquired in the South Seas, and his background as an illustrator was perfect for the pairing of words and pictures. His first book, ONE DAY WITH MANU, is a tale of everyday life on Bora-Bora, and was published in 1933 by Winston, Philadelphia. An immediate success, it was followed by ONE DAY WITH JAMBI in Sumatra in 1934, same publisher. His next book, ONE DAY WITH TUKTU, AN ESKIMO BOY (1935) was based solely on research rather than first hand experience, and Sperry found such a book more difficult to do. Next followed a sea story, ALL SAIL SET (1936), the story of the clipper ship FIying Cloud. A story of the west, WAGONS WESTWARD (1936), was based on his automobile trip over the old Santa Fe Trail. Traveling the southwest opened up a whole new area for him to write about, and out of that experience came LITTLE EAGLE, A NAVAJO BOY (1938). Then came another South Sea book, LOST LAGOON (1939). In 1941 Macmillan published CALL IT COURAGE. Hardly more than novella length, this story about a Polynesian youth, Mafatu, nevertheless achieves an almost mythopoeic quality which fully justifies its presentation as a story which the Polynesians "even today ... sing in their chants and tell over the evening fire." Ever since a terrible experience as a child of three in a hurricane which takes his mother's life, Mafatu has been afraid of the sea. 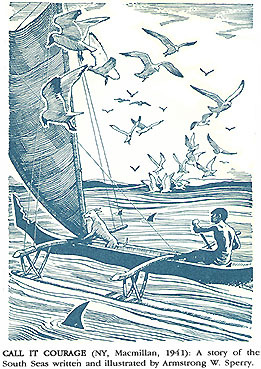 Shamed by his people's contempt, Mafatu sets out in a canoe, accompanied only by Uri, a nondescript yellow dog, and Kivi, a lamed albatross, "to face the thing he feared most." Surviving a violent storm. which carries away his mast, oar, and all of his gear, he helplessly drifts on a mysterious ocean current, finally coming to rest on a mountainous island, presumably one of the Solomons. Here he discovers a sacred place guarded by a hideous idol to whom the cannibals from a neighboring island periodically make human sacrifices, and removes from it a spear which he needs as a weapon. While on the island he proves his courage and skill by making tools to fish with and a raft to fish from; by killing a shark, a wild boar, and a giant octopus, and by building a canoe from a tamanu tree. On the day that his preparations are completed for his journey home, the cannibals return and he narrowly escapes in his canoe, pursued by the savages who paddle vengefully after him for a day and a night. For long arduous days and nights he endures the journey back to his own island, against the ocean current and a fitful wind, finally to arrive triumphantly with a necklace of boar's teeth and a splendid spear ... which vindicates him in the eyes of the Chief, his father. Armstrong Sperry superbly conjures up the setting, both of the sea and of the two contrasting islands, as well as offering a detailed account of the skills by which Polynesians survive. The archetypal character of the story ... a boy's testing of himself which takes on the nature of an initiation into manhood ... held strong appeal. "CALL IT COURAGE meant a great deal to me in the writing but I had no idea that the response to the book would be so wide among children. I had feared that the concept of spiritual courage might be too adult for the age group such a book would reach, and that young people would find it less thrilling than the physical courage which battles pirates unconcerned or outstares the crouching lion. But it seems I was wrong ... which only serves to prove that children have imagination enough to grasp any idea which you present to them with honesty and without patronage." Doris Patee wrote of the book's style: "In Armstrong Sperry's beautiful prose the tale moves smoothly and rapidly like a native chant, and its music rises and falls like the billows of the sea in its setting. Storytellers who have used the story often find children entranced not only by the story itself but by the cadence and rhythm of the language." Two other books by Sperry, LOST LAGOON and HULL-DOWN FOR ACTION, have a similar geographical setting no less vividly portrayed. However, in each, the plot and characterization, belonging to the period before and just after Pearl Harbor, are more standard boys' adventure store fare. The books are exciting but the villains, the inscrutable Jap, the arrogant Nazi, are no more than conventional stereotypes. Two special qualifications made Armstrong Sperry outstanding among the notable writers of children's books of that time. One was his unusual and authentic South Sea subject matter, and the other was that he was both a writer and artist. Helen Follett, whose STARS TO STEER BY (1934) and HOUSE AFIRE! (1941) were illustrated by Sperry, once said to him: "The astonishing thing about you is not that you're a fine artist, or a fine writer, but that you are both!" Sperry replied that being both was a "lot of hard work" but also "lots of fun." Armstrong W. Sperry died on April 28, 1976 in Hanover, New Hampshire, at the age of 78. He wrote and illustrated over twenty-five books and illustrated numerous others for a variety of authors. At the time of his death, he was survived by his wife, Margaret Roberts[on] Sperry, whom he had married in 1930; a son, John; a daughter, Susan Bums; and six grandchildren and a brother. Note from the webweaver: Many thanks to George T. McWhorter, Curator of the Burroughs Memorial Collection at the University of Louisville's Library, and Editor of the Burroughs Bulletin, for providing me with a copy of this article.